The president who doesn't want his daughters to be punished with a baby certainly seems ok with punishing other people for having babies. Long Islander Cornelius Kelly found it would be no problem to secure a family plan for his wife and three older kids through New York’s health-care exchange, but his 18-month-old daughter was out in the cold. The baby would need her own insurance policy. “I couldn’t believe what I was being told,” said the dad from East Quogue, in Suffolk. Kelly said he was no fan of the Affordable Care Act, but when he received notice a few weeks ago that his current insurance plan was being canceled, he tried the New York State of Health Web site. Kelly, 41, and his wife, Jennifer, 42, are self-employed and have always had to buy their own insurance. Kelly runs a title insurance business in Westhampton, and his wife is a pediatrician in private practice in Miller Place. “I initially went on with a lot of optimism,” he said. Kelly said none of the plans offered out-of-network coverage, which was something he wanted. But even worse, they only covered his three older children, who are 3, 5 and 6. When Kelly called a representative, he was told his daughter had to be 2 before she could be covered under a family plan. He would have to buy a separate plan for her, at monthly premiums that ranged between $117.21 and $369.31. The cost would be on top of a family plan with premiums ranging from $810.84 to $2,554.71 a month. So yes. Obamacare disincentivizes having children. Remember the Supreme Court ruled that this was a tax. So Obama has essentially implemented a tax on having children. And Obamacare uses taxpayer money to fund abortion. 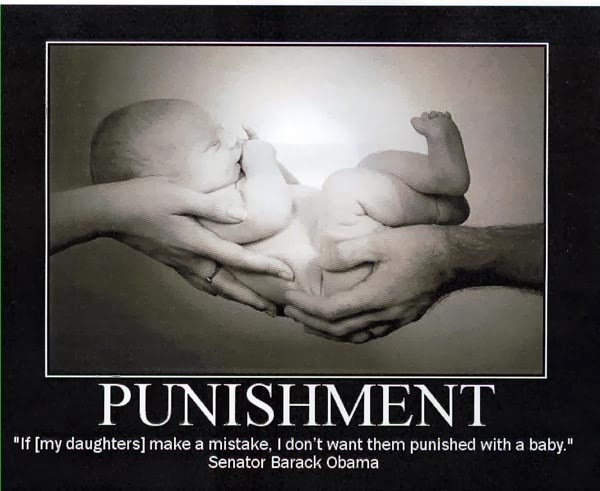 Punish babies. Fund abortion. That's a recipe for success, right? You'd almost start thinking that this administration wasn't all that fond of humanity. I often wonder how these disjoint-brains think all their entitlements are going to be paid for if they kill off or prevent from existing those who will be paying the taxes the entitlements require. So...is this an example of the website working or not working, ha! I have always thought this administration wasn't fond of humanity. No Baby Jesus Christmas postal stamp, either. I really wish we could have a Baby Jesus postage stamp. His mind is firmly in the grip of a force I'd rather not name. To Mary De Voe-it looks like the US Postal Service has reissued the popular Virgin with Child first-class stamp as well as a Holy Family scene first-class stamp for 2013. I'm no fan of the current administration, but it doesn't seem that their anti-Catholic/anti-life bias has yet extended to the Postal Service! (https://store.usps.com/store/browse/productDetailSingleSku.jsp?productId=S_688704 for the Virgin and Child; https://store.usps.com/store/browse/uspsProductDetailMultiSkuDropDown.jsp?productId=S_582004&categoryId=subcatS_S_Sheets for the Holy Family).